Notes: Based on a light novel series written by Ishio Yamagata, with illustrations by Miyagi and published by Shueisha. There is also a manga in production. Adlet Mayer has long since wanted to be a hero, and when the self-proclaimed "strongest man in the world" gains the mark of the flower, an indication that he's been chosen to be one of the six heroes destined to save the world from Youma, he's thrilled, to say the least. After setting out and getting into some mishaps on the way, he finally arrives at the meeting point... only to find out that the grand total of heroes now number seven. Who is the fake? One of my big problems during seasonal rundowns is going through so many shows, dismissing a lot of them from sounding dumb, and then having that show completely turn that opinion around. Rokka -Braves of the Six Flowers- had a problem that was basically the opposite of that. 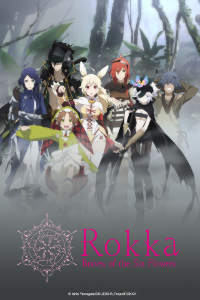 Or rather, it's not that Rokka is a bad show, but it is definitely one of the most frustrating shows I've watched in a long time, and for mostly reasons that are new to me, at least in anime. Indeed, the intriguing angle of the show -- the "whodunit" mystery -- was one of the reasons I wanted to watch it to begin with, and for what it's worth, the show is pretty good at it. But, perhaps much like its main character, the show got a little full of itself, because for most of the 12 episodes that makes up this cour, that's just what we get. Adlet Meyer is the strongest man in the world. Don't worry if you missed it the first time he told you, because he'll only remind you about it every chance that he gets. He makes one hell of an introduction when he basically photobombs an official duel between two characters and defeats both of them through an admittedly impressive array of tools and gadgets. He does come across as a massively arrogant tool at first, though a look back at his childhood later takes some of the edge off that by explaining why he's acting like he does. Hilariously, he earns himself a trip to the local town jail for his troubles, which is honestly in line with what he deserves. Well... except that the town itself, particularly its leaders and the two guys Adlet defeated, comes across as a bunch of really sore losers. The first character and fellow hero he meets up with is Princess Nashetania, who plays up the "mystery beauty" a little bit too hard when she visits him in jail and at all times afterward. She comes across as somewhat mischievous and secretive at first, which later evolves into full-on manipulation at times. She takes a bit of an interest in Adlet, and seems to be delighted to be one of the chosen. She has a knight-in-shining-armor in Goldov, a guy who was already out on a mission to investigate the Youma when they meet up. His personality isn't developed a whole lot outside of his rather obvious feelings for the Princess and the devotion that goes with it, and, again, some amounts of jealousy over Adlet, who has captured his Princess's interest. The team quickly meets up with Flamie Speeddraw, a mysterious woman who travels around killing the potential braves. She's a master gunsmith and, surprisingly, ends up being a brave herself, though a rather obvious suspect as the seventh later on. She does have a past of her own that is revealed quickly and marks her as "not the seventh" with the audience (if not the others braves.) Among the last three, we have Hans Humpty, who is an assassin for hire. There's Maura Chester, the Saint of the mountain, and her travel companion, the somewhat psychotic Chamot. Weirdly enough, Chamot is a child, yet still considered the most powerful of the lot, and with a murderous attitude to go with her skills. This might all sound very simple the way I put it, but to its credit, the show's character show some complexity in build. I just want to be careful about putting too much out there, because the show basically builds itself and lives on how they are portrayed, and how each revelation feeds into your suspicions on who the seventh one is. Of course, some of the characters get a free pass from the start. Adlet, for instance, is obviously not our seventh since he's our main star. Flamie kind of comes across as the one at first, before everyone even knows there IS a seventh, but Adlet, who quickly takes a shining to her, dispels that notion, at least for the viewers. Chamot, who's a child, as well as not exactly the sharpest tack around, kind of disqualifies as well. That leaves us with Nashetania, Goldov, Mora and Hans, which is still a large enough group to make this mystery event exciting. Well... technically, Adlet and Flamie -- or even Chamot -- could be the seventh, depending on the show's willingness to go for dumb plot twists, but thankfully, the show doesn't do that. What it does, however, is quickly make the other character suspect Adlet to be the seventh, and then lead the audience on a merry chase for the remainder of the show. As intriguing as the mystery is, all the way up to the final reveal, the show wastes far too much time on this. We already know Adlet isn't the one, so all this fighting about is almost entirely pointless. Some of it would've been fine, sure, but even in the face of reasonable doubt, some of the other characters will push it right back on track, and by "track", I mean "KILL ADLET! HE IS THE SEVENTH!" It's the kind of idiot ball that harms an otherwise somewhat clever show, because if the seventh goal is to separate and kill the others, the problem could be solved by all seven staying together at all times. It's not like they'd have any alternatives, since they are all trapped at the temple, inside a barrier, anyway. But of course, that's some of the characters' way of casting suspicion on themselves, and if Rokka knows how to play some games, the baiting game is definitely one of them. To make matters worse, the art and animation is all over the place. 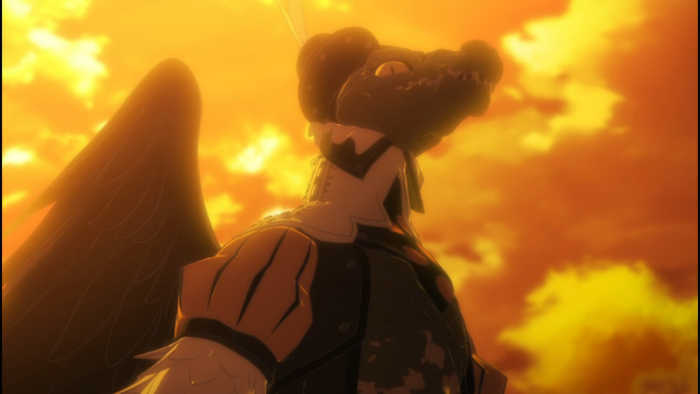 Rokka made a pretty great first impression -- Adlet's first fight was inventive, fun and creative in its own right. The show mixes magic with science -- most of Adlet's tools are mechanical or chemical in nature. He doesn't seem to have any supernatural skills. Well, I guess Hans and Goldov doesn't have any particular magical skills either, as this seems to be the territory of the saints, all of which are women. Sorry. Got sidetracked there for a second. Kind of one of the things that happen when you watch this show. Anyway, the animation. It's actually quite good at times, like in Adlet's introduction, particularly the fight he kind of takes over in a rather rude fashion. This becomes more of a variable later on, and even worse, the characters themselves starts looking almost hilariously inconsistent. (Or it would be hilarious if the show had been bad enough for me to stop taking it seriously.) Also, while character art is one thing, the Youma are a chapter of awfulness by themselves. Most of the regular ones take the shape of monsters with vague animal traits, which is fine, except for the fact that they have this glossy look to them that makes them resemble plastic toys. And none of them look as positively ridiculous as Tgurneu, some kind of crocodile Youma, looking all dapper, dressed up with a slanted tophat adorning his scaly head. I mean... just look at him! I think the only appropriate response when seeing that is: "Ha ha oh wow!" He only shows up briefly, but his appearance and way with language just points out more flaws with the show. I'm guessing it wants to have an element of "man is the real monster" with the Youma, but most of the time when we see them, they are attacking villages and killing everyone in it. Most of the regular one seems somewhat non-sentinent, but the show later negates this. They are literally evil in every sense of the word, which is weirdly disappointing seeing as the show wants to be seen as more than that. Particularly in light of the fact that Hans have it within him to be a hero, even though he works as an assassin because, in his own words, "the world isn't as nice as you think it is", meaning he's probably been hired for a lot of political killings, or at the very least less admirable ones... if there can be such a thing as an "admirable assassination". And that's not even getting started on Chamot, our little psychotic, who is more than happy to kill or torture people. In fact, after the whole debacle started, at some point Chamot decides that she might as well just kill everyone except Maura (whom she cares for) because it's the easiest and most convenient method for her. In a weird way, I can respect the show for having an angle where one's abilities is what decides who becomes the hero -- lord knows I'm a bit tired of having clumsy nobodies show out of nowhere and conveniently surpass every single goddamn hero just like that, simply because they were "destined" to -- but I'm having a bit of a hard time swallowing the fact that a loose cannon like Chamot would be chosen as a hero by a patron deity just because she's really effective at torture and killing. But really, my main beef with the show is how it's been continuously trolling the audience. It disproves Adlet as the seventh, and then spends most of the show having him doing that to the others. it introduces theories, just to immediately disprove them. There's the aforementioned scene where the whole thing almost ended, only for one of the character to idiotically insist "NO! ADLET IS THE SEVENTH! HE MUST BE KILLED! ", which was most likely meant to cast suspicion on said character. If the show hadn't ended with the mystery revealed, and with an explanation that makes sense both biologically and scientifically, I wouldn't have been nearly as kind to it. Even with its final troll; the one that sets him up with a love interest, just to introduce another female character whom which he had a past (how?) as well as basically resetting another aspect to it. Which one, you might ask? Just... watch and see.